This booklet was created to provide separated and divorced parents with parenting plans based on the latest research. 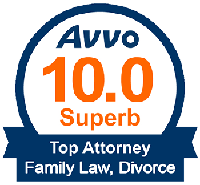 The objective is to honor the best interests of children as well as to help parents tailor realistic custody plans. These guidelines are not intended to be mandatory rules. In the event the parents are unable to agree to a parenting plan, the court, after a hearing, will be required to determine what is in the best interest of the child(ren). This booklet addresses an overview of parenting plan guidelines, definitions of legal and physical custody, suggested schedules for parental contact at various stages of a child’s development, and options for parental contact on holidays, special days, and school breaks. Additional information to help parents is presented in “Essential Considerations” following each section. Worksheets to assist parents in crafting a parenting plan are provided at the end of the booklet. Research findings suggest that in an effort to maximize a child’s adjustment to the process of separation and divorce, parents should cooperatively plan to establish a parenting arrangement that will ensure the child’s right to continuous and frequent contact with both parents. The following guidelines are based on the age of the child and stage of development. In each age category, guidelines are provided to help parents select from options that will best meet their child’s needs. A parenting plan specifies both Legal Custody and Physical Custody, which are described below. On the next page are Essential Considerations for sharing of Joint Legal Custody that are common to most parenting plans. Joint Legal Custody means that both parents shall share the right and the responsibility to make the decisions related to the health, education and welfare of the child (Family Code Section 3003). In making an order for custody with respect to both parents, the court may grant joint legal custody without granting joint physical custody (Family Code Section 3085). Sole Legal Custody means one parent shall have the right and the responsibility to make the decisions related to the health, education and welfare of the child (Family Code Section 3006). Joint Physical Custody means that each of the parents shall have significant periods of physical custody. Joint physical custody shall be shared in such a way so as to assure a child of frequent and continuing contact with both parents (Family Code Section 3004). In making an order for joint physical custody, the court may specify one parent as the primary caretaker of the child and one home as the primary home of the child, for the purpose of determining eligibility for public assistance (Family Code Section 3086). Sole Physical Custody means a child shall reside with and be under the supervision of one parent, subject to the power of the court to order visitation (Family Code Section 3007). Joint Custody means joint physical custody and joint legal custody (Family Code Section 3002). • The parent who has the physical care of the child at any given time shall have the routine decision making rights and responsibilities during those periods of time; however, all major decisions pertaining to health, education, and day care shall be made jointly by the parents. No prior consultation is required between the parents regarding emergency medical or dental treatment, routine checkups, or minor illness. However, the other parent shall be notified immediately in the case of an emergency. A sharing of routine health information is encouraged. • Notwithstanding any other provision of the law, access to records and information pertaining to a minor child, including, but not limited to, medical, dental, and school records, shall not be denied to a parent because that parent is not the child’s custodial parent (Family Code Section 3025). • Each parent shall keep the other advised within a reasonable time when the minor child visits with the doctor, hospital, or place of medical treatment (excluding checkups), including the date of the visit, the name and address of the doctor, the condition treated, the results of the treatment, and a description of any follow-up appointments made. • Parents are responsible for keeping themselves advised and for advising each other of all school, athletic, and social events in which the child participates including but not limited to school report cards, school meeting notices, requests for school conferences, notice of activities related to the child, and order forms for school pictures. • Each parent shall keep the other advised at all times of his/her current residence and business address, telephone numbers (home and work), the child’s school and daycare, and the location of where the child will be spending any extended period of time (two days or more). • Each parent is to provide the other with the address and telephone number at which the minor child resides. A parent shall notify the other parent if the parent plans to change the residence of the child for more than thirty (30) days, unless there is a prior written agreement to the removal. The notice shall be given before the contemplated move, by mail, return receipt requested, postage prepaid, to the last known address of the parent to be notified. A copy of the notice shall also be sent to that parent’s counsel of record. To the extent feasible, the notice shall be provided within a minimum of forty-five (45) days before the proposed change of residence so as to allow for mediation of a new agreement concerning custody (Family Code Section 3024). • Neither parent shall enroll the child in activities that require a commitment from the other parent or interfere with a previously agreed upon or court ordered schedule without mutual approval. • Neither parent shall submit the child to any psychological/psychiatric testing or evaluation or to any extended course of medical, dental, orthodontic, psychiatric, or psychological treatment/counseling without the consent (preferably written) of the other parent or court order. • Both parents consent and/or court authorization is needed before changing of the child’s surname, obtaining a passport and driver license, and approving underage marriage or enlistment in the military. In order for infants and toddlers to develop secure attachments to their parents, it is critically important that the separation time from the mother and father be small to minimize anxiety, keep attachments secure, and keep the child comfortable with both parents. It is hard for the child to maintain a memory of the parent if the parent is not there. Infants and toddlers have difficulty conceptualizing time and need frequent and continuing contact with a predictable pattern. Separation anxiety is most intense around fifteen (15) to twenty-four (24) months of age. Although it is normal for children at this developmental stage to cry and cling during transitions, most children can be quickly comforted by each parent. *The following options are dependent upon the age and maturity of the child, pattern of contact with each parent, family lifestyle, and presence of siblings. Gradual increase of the less attached parent’s contact should occur over time. • Degree of Attachment – Attachment can be defined as the level of trust, security, and bonding in a parent/child relationship. If a parent has not had contact with an infant to 3-year-old child for an extended period of time or has not been involved in the day to day care of the child, contact should start slowly and gradually increase as the child adjusts and feels more comfortable. • In order to maximize child’s trust and security, it is critical the less attached parent spend significant alone time caring for the child. • Information regarding the infant/toddler’s diet, medications, daily routine, etc. should be provided by the custodial parent. • In order to communicate the feeling of security to the child, it is usually best the primary parent deliver the child to the other parent. • Exchanges are to be done quickly with no excessive delays. • Security object(s) may go with the child. • Days of contact should be consistent. Current research suggests that children in this age group can form strong attachments to both parents as well as other adults and caregivers. Along with the growing ability to form attachments with many people comes the ability to tolerate longer periods of separation from attachment figures. Important for children throughout the preschool years are consistency, predictability, and structure. *The following options are dependent upon the age and maturity of the child, pattern of contact with each parent, family lifestyle, and presence of siblings. • Consistency, predictability, and structure are important during the preschool years. • Children in this age group are able to follow their schedules using color-coded blocks of time to represent time with each parent marked on a calendar. • Children in this age group are able to understand one parent may do things differently than the other parent, or rules may differ in different places. • Preschool children are capable of spending overnights with each parent; however, weeklong blocks of time may seem very long to such young children, and a visit with the other parent midweek may be necessary. • Most important for children in this age group is that they are not exposed to parental conflict. Exposure to parental conflict can cause young children to experience anxiety and to regress to younger behaviors. • Nightmares are common for young children and some of their anxieties are often expressed as fears or through nightmares. Nightmares do not necessarily mean the child is having bad experiences with either parent. • Young children are very self-centered and often dislike changing activities when they are interested in a particular activity. They may cry, for example, when dropped off at preschool or when they are picked up from preschool. Similar protests can occur during parental exchanges of the child. • If a child cries when one parent picks up the child, this may mean only that the child does not want to “switch gears”; and such incidents should not be universally interpreted to mean that there is a problem between the parent and child. Most six to eleven-year-old children can handle moving back and forth between parents’ homes with ease, although some children do better spending more time at one home. The child’s school schedule, extra-curricular activities, parents’ work schedule, and availability to provide transportation and supervision, are important factors in deciding on a parenting plan in this age group. Stability, predictability, ensuring the child’s preparedness for school, and protection from parental conflict are essential to the child’s adjustment. Parent A – Alternate weekends Saturday and/or Sunday from 8:00 a.m. to 4:00 p.m.
and Wednesday evenings from 6:00 p.m. until 8:00 p.m.
Parent A – Alternate weekends from Friday at 6:00 p.m. until Sunday at 6:00 p.m.
and Wednesdays from 5:00 p.m. until 8:00 p.m.
Parent A – Alternate weekends from Saturday at 8:00 a.m. until Sunday at 8:00 p.m.
and Tuesdays and Thursdays from 5:00 p.m. until 8:00 p.m.
*Parents may agree on any combination of the above. • Parents need to communicate with each other about establishing consistent rules, structure, and discipline for the child. • Exchanges should be done quickly and without conflict to reduce transition issues for the child. • Exchanges may be done by pickup and return at school or daycare. • Neither parent should schedule outside/extracurricular activities that interfere with the other parent’s court-ordered time with the child without mutual agreement. • Parents need to agree mutually on any rescheduling in a timely manner. • Parents should communicate when there are changes in the schedule. Adolescents are developing a separate identity from their parents and typically are more focused on activities and relationships outside the home. At the same time they need ongoing contact with both parents and continued guidance about rules and standards for their behavior. Adolescents often want to be more independent and to have a say in their living arrangements. Parents may find it helpful to allow older teens to express their ideas for schedules and living arrangements, while making it clear that it is still up to the parents to make the final decisions. Flexibility is the key in accepting children’s increasing ability to care for their own needs and make more of their own decisions, while making sure that access to both parents occurs on a regular basis. • It is not unusual for teenagers to be angry or embarrassed by the break-up of their parents and to side with one parent over the other. It is important for both parents to be sensitive to their feelings, yet both parents need to encourage ongoing contact with that parent in spite of these feelings. • Older adolescents may resist a rigid weekly schedule and may prefer to make adjustments in the schedule based on school activities or other extra-curricular activities. • Both parents need to support their children’s participation in extra-curricular activities even if it conflicts with their parenting time. • Effective parental communication and cooperation are required in order to support adolescents in their school and extra-curricular activities. • While input from their child should be considered, it is the final responsibility of the parents to agree upon the parenting plan. • Parents should not use the children as messengers, but should communicate directly with one another. 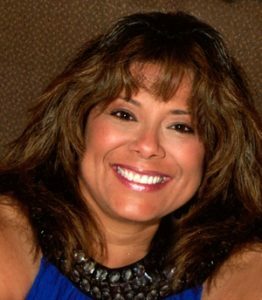 • Flexibility and communication are keys in maintaining positive parent/child relationships. • Parents should not rely upon their children for emotional support. • Often teenagers after having lived with one parent wish to spend more time or to live with the other parent. Developmentally this can be appropriate since the adolescent is struggling with forming an identity and often needs to have meaningful contact with the other parent to successfully form their self-concept. Holidays legally recognized as school holidays by the State of California, along with Mother=s Day, Father=s Day, and other frequently celebrated holidays, are included below. Parents may wish to add other holidays and days of special family significance, such as religious holidays and birthdays. Pick-up and drop-off times should be specified. Suggestions for several levels of contact are provided. 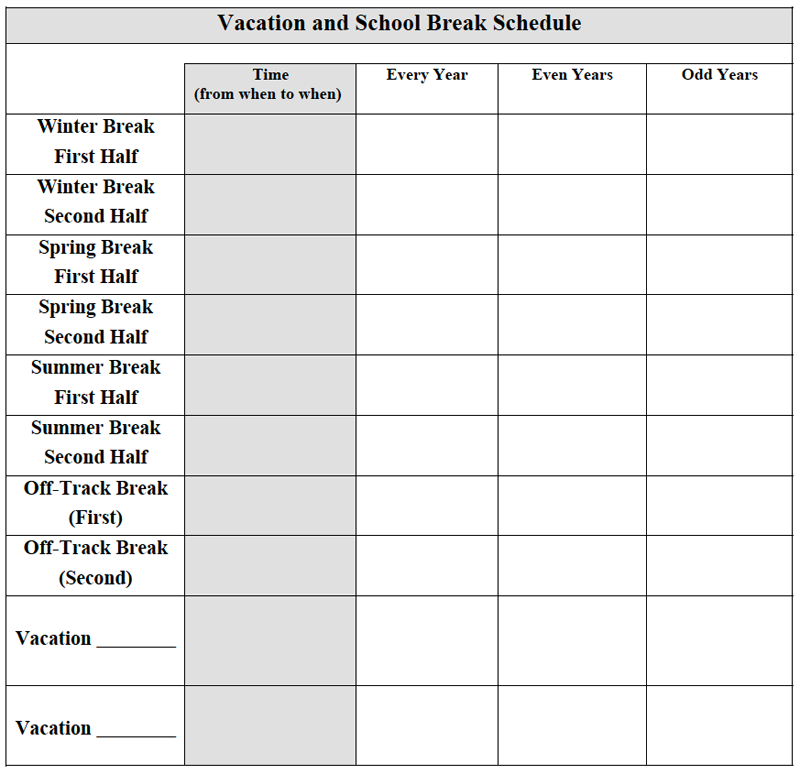 Schedules for school break periods can be found in the “Schedules for School Breaks” section. parent has the same period in even years. B – One parent has extra time scheduled during all or part of the day. C – There is no change from the usual schedule. A – One parent has a period of time from Saturday to Sunday in odd years and the other parent has the same period in even years. A – One parent has the period from July 4 to July 5 in odd years and the other parent has the same period in even years. 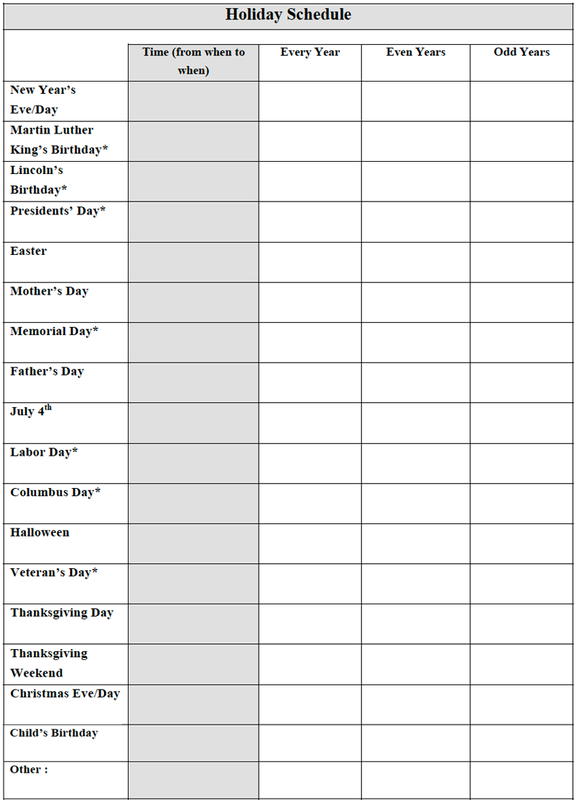 B – One parent has extra time on or near the holiday. 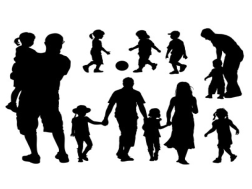 A – One parent has all or part of the four-day holiday period in even years, and the other parent has the same period in odd years. B – One parent has Thanksgiving Day in even years, and the other parent has the day in odd years. participates in activities with each parent. D – There is no change from the usual schedule. A – One parent has the period from midday December 24 until midday on December 25 in even years, and the other parent has this period in odd years. The parent not having December 24-25 has the children from midday on December 25 until midday on December 26. B – One parent has extra time on the holiday or part of the holiday weekend, or the child participates in activities with each parent. A – The parent with the weekend adds the Monday or Friday holiday to the weekend. B – Each individual Monday or Friday holiday is assigned to one parent in odd years and the other parent in even years. C – One parent has additional time on all or some of the Monday and Friday holidays. $ It is important for children to experience holidays with both parents and to develop holiday traditions with each parent and extended family as much as is possible. $ Parents should remember that whatever the relationship between the parents may be, the children probably want to acknowledge holidays and special days with both parents and may need the help of both parents to do so. $ It is critical for both parents to have the child’s school schedule available when making holiday parenting plans. $ Holiday traditions involving travel to family gatherings should be considered when dividing holiday time. When travel or distance are issues, longer blocks of holiday time in alternating years may allow the children to participate fully in holiday activities with a parent or extended family members who live far away. Parents should be prepared to be flexible when holiday share plans involve travel. $ Parents spending a holiday with a child may wish to facilitate some contact, such as a telephone call with the other parent on the holiday or special day. $ Participation in holiday activities, such as choosing gifts, etc., may mean that parents, regardless of their conflicts, must work cooperatively in the best interest of the children. $ Parents should keep in mind the ages and needs of children when forming holiday parenting plans. Holidays are extremely important to younger school-age children. Infants and toddlers may be unaware of the holiday and their presence at family gatherings may be more important to the adults. Older adolescents and teenagers may be less excited about holidays and holiday activities than younger children. $ Safety and enjoyment of the holiday should be the primary concern when planning holiday times with children. Children of all ages benefit when parents establish a “business-like” (the business of parenting) method of communication. This allows parents to communicate clearly and courteously with each other about the children. When parents give each other as much advance notice as possible regarding vacation plans, this eliminates the potential conflict for the child. It is also helpful for parents to take into consideration the child’s regularly scheduled activities or summer school dates prior to finalizing vacation plans. Vacations, holidays and special days usually take priority over the regular parenting schedule, without making up the lost time. Afterwards, the parents should return to their regular parenting schedule. A – Presuming that one (1) regular weekly overnight has been ongoing, infants to 18- month olds may have three (3) consecutive overnights. 3 year olds may have two (2) seven (7) day periods of vacation time, separated by at least four (4) weeks of the regular schedule. C – If the child has older siblings, he or she may adjust to longer periods of vacation time which may be arranged on an individual basis by the parents. D – For child with little attachment to one parent, vacation time should not vary significantly from the regular weekly schedule. 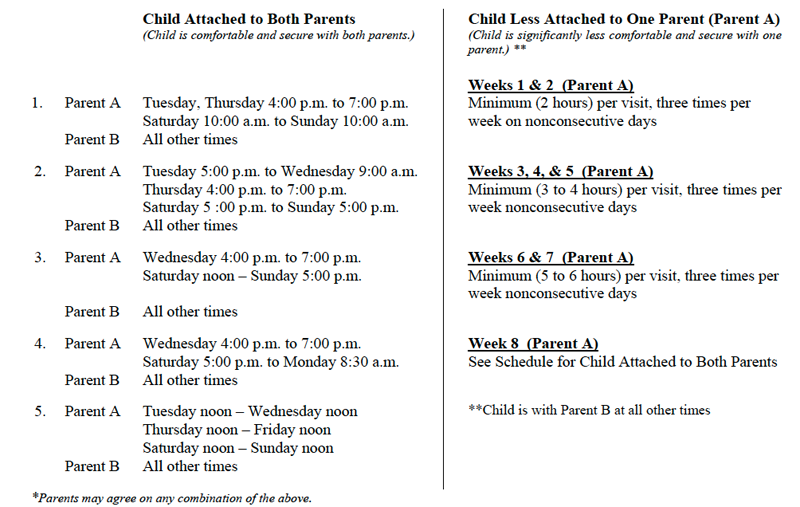 B – Each parent to have two (2) one (1) week periods of non-consecutive vacation time with the child. C – If the child has older siblings he or she may adjust to longer periods of vacation time. B – For children age 6 and older, parents may alternate weeks during the school break Periods. C – For children 8 years and older, each parent may have up to four (4) consecutive weeks of vacation time. D – For children 8 years and older, parents may alternate the months of July and August each year. E – For children 8 years and older attending non-traditional school, parents may share all off-track periods equally throughout the year. Options: A – Each parent to have two (2) two (2) week periods of vacation. 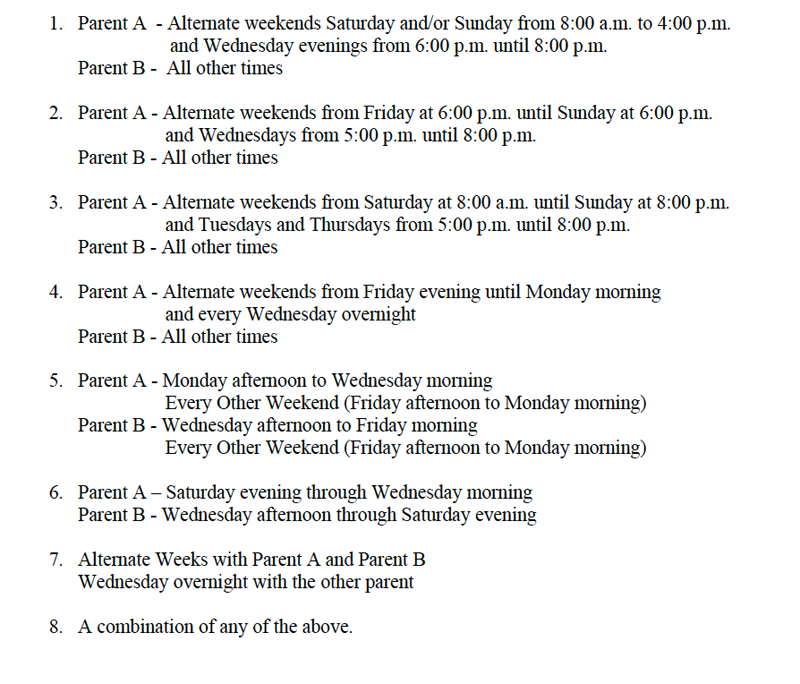 B – Parents may alternate weeks of all vacation periods. C – Each parent to have up to four (4) consecutive weeks of vacation each year. D – Parents may alternate the months of July and August each summer. E – For children attending non-traditional school, parents may share all off-track periods equally throughout the year. • Each parent to give the other parent thirty (30) days advance written notice as to vacation dates, destination, and phone numbers of where the child and parent can be reached. • Telephone contact is recommended to increase the child’s sense of continuity and security during the out-of-town vacation time. • If the child is in town during a four (4) week vacation period, the non-vacationing parent may want to arrange a weekend or mid-week contact with the child. • Parents should give consideration to the child’s activities during the summer before making final vacation plans in order to avoid conflict in schedules. • Older adolescents may resist a rigid vacation schedule and may wish to express their ideas for a summer schedule that includes their activities and interests. • It is critical for both parents to have the child’s school schedule available before discussing vacation and school break plans. Parents can use these worksheets as a tool for making parenting plans. Times and parents’ names can be entered into the spaces to specify custodial periods for each parent. 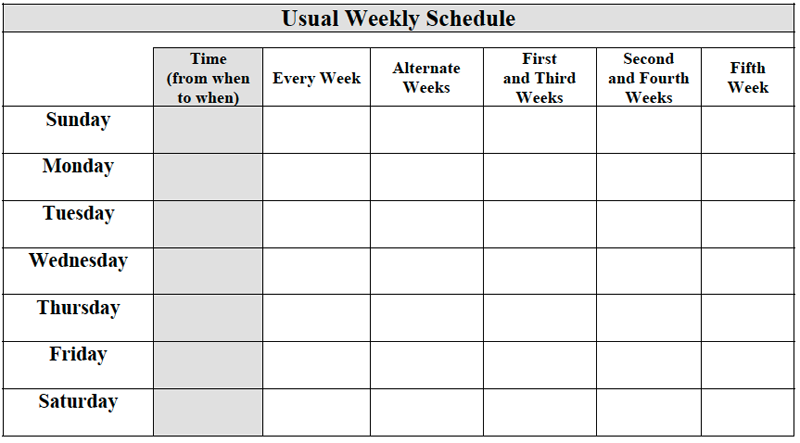 A traditional monthly calendar and a weekly worksheet are provided for planning the usual weekly schedule. In the vacation and school break planning portion, spaces are provided to accommodate children in both traditional and year-round schools, and vacation spaces to accommodate vacations for both parents are included. Various frequently celebrated holidays are included as a reminder to parents. Space is provided for parents to add other family holidays and special days. When a child’s physical or emotional safety is at risk, it is necessary to protect the child. Parents who have concerns about these issues should seek help from an attorney, mental health professional, court services, domestic abuse agency, or local social service agency. When choosing a parenting plan, parents should consider the child’s relationship with each parent. If a parent has never been a part of a child’s life or has not had contact with the child for an extended period, access should start slowly and gradually increase as the child adjusts and feels comfortable. • Initiate the child’s contact with the other parent on a regular basis by phone, letter, audio and videotapes, e-mail and other forms of communication. • Plan their vacations around the child’s regularly scheduled activities.